The Oppo R17 Pro is launched in India with a triple camera set up at the back and an in-display fingerprint sensor. We pitted the phone against the OnePlus 6T to see is the Oppo latest smartphone a flagship killer? The Oppo has launched its premium mid-range segment smartphone Oppo R17 Pro in India on December 4. The phone comes with a Qualcomm Snapdragon 710 octa-core processor and features a triple camera setup at the back. 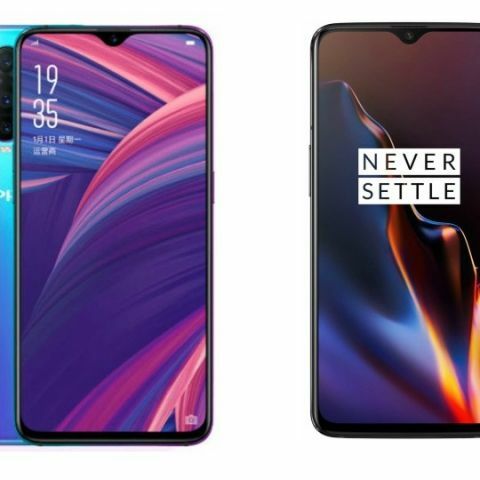 On the other hand, we have the OnePlus 6T that also comes with an in-display fingerprint sensor and a dual rear camera. Let’s do a quick specification comparison of the two to see which one packs a better hardware under its hood? When it comes to the display, there is no difference between the two devices as Both smartphones come with a 6.4-inch display that offers a resolution of 1080 x 2340 pixels. When it comes to the processor, the OnePlus 6T is powered by the latest Qualcomm Snapdragon 845 processor, which is faster than the Qualcomm Snapdragon 710 processor in the Oppo R17 Pro. As far as the cameras are concerned, the Oppo R17 Pro features a triple 12MP + 20MP + TOF 3D sensing camera at the back. The TOF camera allows you to map objects accurately within a distance of up to 3 meters. At the front, it has a 25MP front shooter. Coming to the OnePlus 6T, the phone features a dual 16MP + 20MP rear camera with a 16MP sensor at the front. 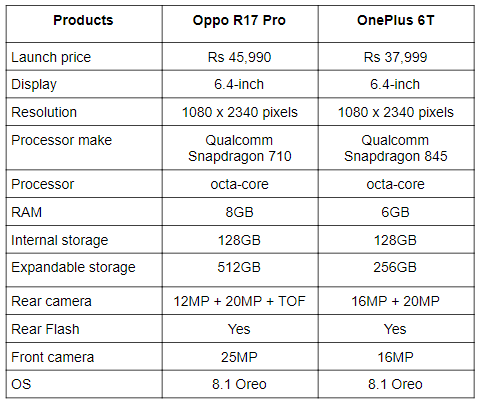 The Oppo R17 Pro 8GB/128GB variant is priced at Rs 45,990 in India, while you can get the OnePlus 6T for Rs 37,999.